Being safe around electricity, natural gas and propane outdoors is being smart. Electrical safety is important. 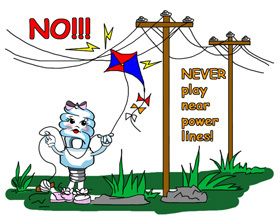 From power lines to power mowers, even a small amount of electricity can hurt you. Remember, electricity is always looking for the easiest path to the ground. The ground is the earth or something touching the earth like a ladder. When we see birds sitting on a power line, they don't get shocked because they are not touching the ground at the same time. Natural gas lines are buried underground, so be aware of where they are located. If you smell gas outside near your home, call your gas company to report it.